Whether you want to learn to drive the transmission type popular and commonplace around the world, or get familiar with common sports car controls, at HondaCivicRepairs.com, we've created a virtual tool to help you learn and practice how to drive manual transmission online. This manual transmission simulator can help you familiarize yourself with the basic controls and gauges before getting behind the wheel of an actual manual transmission vehicle. Press down on the accelerator pedal and watch your RPM needle jump. Press on the clutch pedal and simulate the free wheeling motion as your speedometer remains steady and gradually drops slowly. 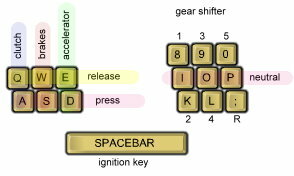 Double-click on the keys for any of the pedals and observe the applied pressure holding steady. You may experience a lot of stalling on your several first attempts, but have no worries, this is all simply virtual; no actual gears can be damaged in this process. Learn the concepts and practice the key controls below to get started now. Enjoy! 1. Make sure shifter is on Neutral gear. 2. Fully press down on the clutch pedal. (Good habit to fully press down on brakes as well before starting). 1. Shift to 1st gear. 2. Release brake if pressed. 3. Press down on the accelerator pedal and maintain 2000 - 2500 RPM. 4. Release the clutch slowly until you feel the clutch engage. 5. When you feel the clutch engage, slowly press down on the accelerator to sustain RPM while slowly releasing the clutch pedal. 5. Fully release the clutch pedal. 1. Fully press down on the clutch pedal. 2. Shift to Neutral gear. 3. Fully release the clutch pedal. 4. Gently press on the brake pedal. 2. Keep note of the current RPM on your gauge while you are currently in gear. 3. Shift into desired gear. Do not shift into low gears while moving at high speeds. 4. Press down on the accelerator pedal enough to maintain the RPM you observed earlier. 4. When you feel the clutch engage, slowly press down on the accelerator to sustain RPM while slowly releasing the clutch pedal. c. Stay in Nuetral gear. d. Apply enough RPM before shifting into higher gear.